Innovation + Not-for-Profit = Odd Couple? Let’s be candid. We do not often hear the words innovation and not-for-profit used in the same sentence. 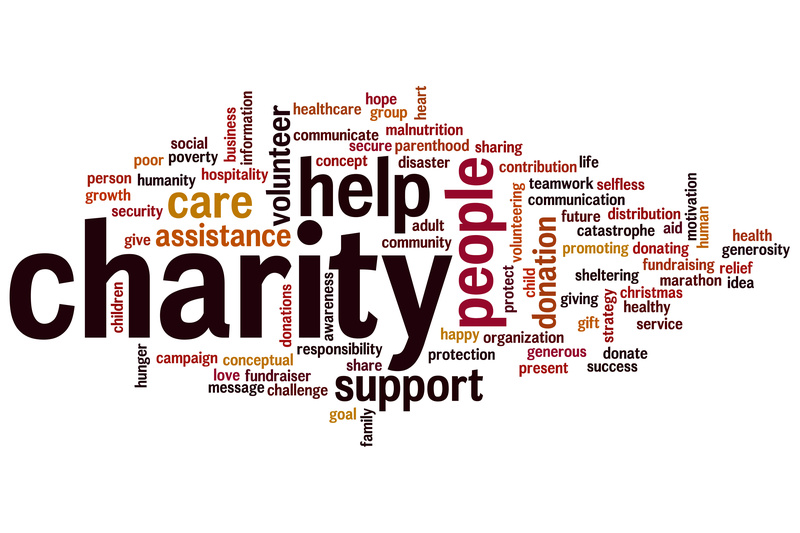 Charities are not known to be forward-thinking and are often times in the shadow of their for-profit counterparts as a result. 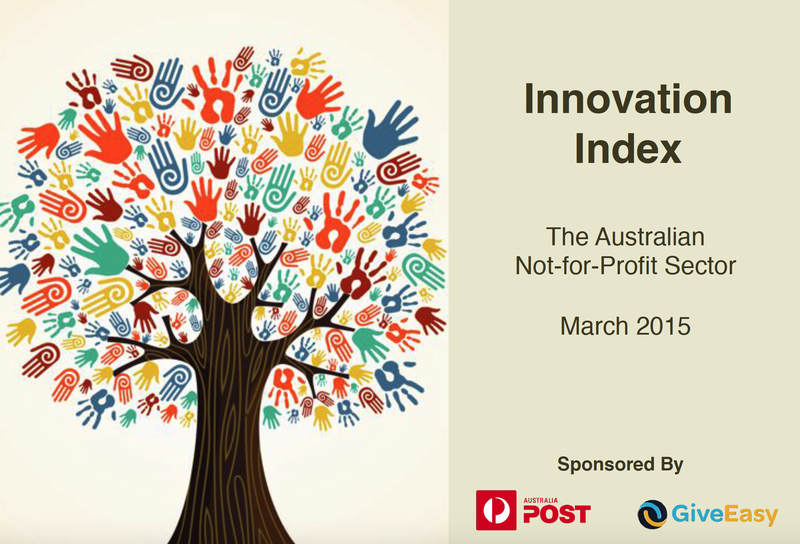 Australia Post and GiveEasy have conducted a study to determine which Not-for-Profit organisation are truly the most innovative through the Innovation Index – Australian Not-for-profit Sector 2015. The Innovation Index – Australian Not-for-Profit Sector 2015 is a study of the sector’s current innovation capability. The Index report is a compilation of a survey of more than 744 professionals working across the NFP sector from every Australian state and territory. Mid- to large-sized organisations employing 11-100 staff. Ones that have national and/or overseas footprint (not one state). Working in the environment, lobbying or youth sectors. Treat beneficiaries and the private sector as important as front line staff and management as sources of innovation. Developing over half of their innovations from outside the organisation. Working hard to bring in new funding. Financially rewarding innovation activity (not just paying it lip service). Has a publically stated innovation policy that all employees know about. Building their own apps as well as just being on Facebook and Twitter. Hiring staff across all age groups including under 25s and over 50s. Focused on retaining employees for 4 or more years. Running a budget of $500-$1m or $2m-$10m. Continually getting funds from new sources. Does your NFP display the above attributes? Internal collaboration within organisations in the sector needs to be improved. Effective collaboration with stakeholders is a key driver of innovation – the sector overall needs to work harder to solicit feedback from external stakeholders on a regular basis. As in the corporate sector, setting aside time to innovate is a challenge – but it is a necessity if the organisation is to innovate effectively. Those organisations that make time for team members to work on opportunities beyond the daily urgencies reap the rewards. It appears that the status quo of NFP organisations is challenged infrequently. In a world where disruption is rife, and most industry sectors need to justify their customer value proposition frequently, it would be expected that the NFP sector would be more self-questioning. Organisations need to be receptive to change, and agile in their response. While a very high number of people believe that it is important to be innovative in their organisation, there is little or no reward for innovation in the sector – either financially or through promotion. A NFP might be expected to have a very high focus on its stakeholders. Only 63% believe they have a deep understanding of the needs of their stakeholders. The above is summary lifted directly from the Innovation Index. To learn more and to gain greater detail, download a copy today. Special thanks to GiveEasy and Australia Post for conducting the study, offering insights into our sector, and identifying areas for improvement. Congratulations to the ten NFPs recognised from their peers as being the most innovative. The Australian NFP sector has much to learn from studies such as this one. Is the person who lives here on your list? I walk by this home a couple of times per weekend because the house is on the same street as my Brisbane apartment. I chuckle each time I walk by the house. I am not making fun of the owner. 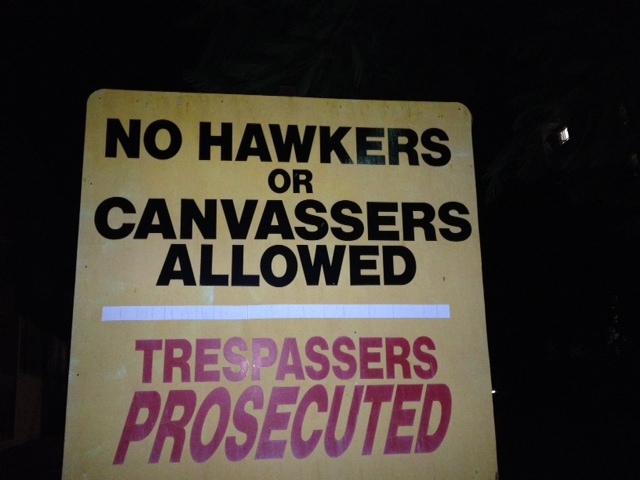 It is within his or her right to post such a sign on their own property and on their letterbox. I simply wonder how many charities have this person on their database and I wonder if the person has ever alerted charities he/she wishes to be on a do not contact list, a do not solicit list, or some other alert. The above examples allow your organisation to include all other supporters in all appeals and only include supporters marked “Tax Appeal” or “Christmas Appeal” if they have such a code in their record in the CRM. The above examples allow your organisation to include supporters with these codes when doing an email newsletter or when doing post newsletter, but to exclude them when doing one or the other if they have the opposite code in their record in the CRM. The above example allows your organisation to exclude anyone with this code from a telemarketing campaign when their is a solicitation involved. If the campaign involved a thank you call or some other purpose, your organisation might include the supporter in the calling program. Communication preferences are vital. Organisations over-engineer and other organisations under-engineer the tracking of this critical data. Doing so means your organisation is short-chaning the donor and your organisation. Don’t cheat your supporter out of communications he or she may value. And, don’t cut the supporter off from communications, which will cause you to ultimately lose the support of the donor as a result. Giving days are becoming VERY popular! Giving days appear to have started in the university sector in the United States some four or five years ago. The giving days focus alumni, donors, and prospective donors on initiatives to support in a single day. Giving days are becoming very popular. In fact, this year we are seeing…giving weeks! 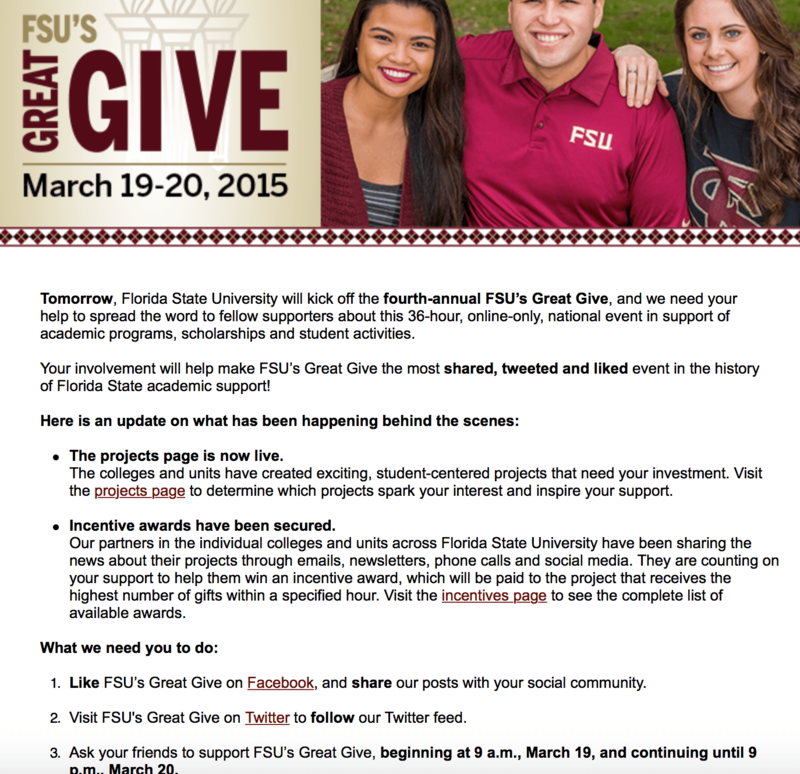 Universities such as Florida State University, Boston University, and countless others have giving days or weeks! Sacramento, California’s capital city, has a Big Day of Giving where the city has partnered with a variety of community foundations to encourage people to “Give where your heart is”. And, it does not stop there. Charities such as the Red Cross are holding giving days as well. Why are these days (or weeks) so popular? Not only is there a big opportunity to raise money, but the giving days offer a chance to really get the word out and to allow people to have a greater emotional connection to your organisation. Columbia University reported raising over $11 million on its 2014 giving day via 10,452 gifts from 50 states and 53 countries! Now, that’s reach. It won’t be long before every one of the marquis universities in Australia join this trend. But, why stop there? Why wouldn’t charities, healthcare and medical research institutes, museums, and private schools jump on the bandwagon and test a giving day themselves? Not including an ask? Don’t send it. Every day I receive charity mail. Mail from those included in my personal direct marketing study and mail from those organisations I support independently. I often times get asked what is the thing that shocks me the most as you look across the charities? The thing that surprises me the most is organisations that send an appeal, a newsletter, an annual report, or other material without making an ask for a donation. Just this week I received a beautiful newsletter from one of the nation’s leading medical research institutes. I opened the envelope, pulled the newsletter out, opened the newsletter and I wanted to scream. No ask was included in the envelope. 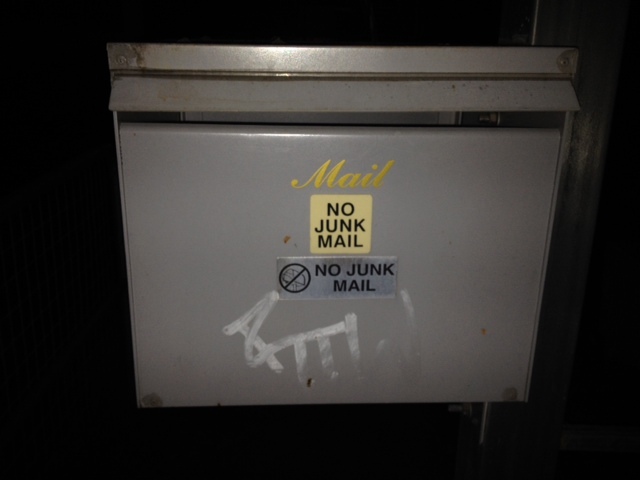 No response device with a self-addressed envelope. The research institute included a response device printed on page 5 of the 6 page newsletter. How many people take the time to clip this device out of the newsletter to make a gift? If you are going to take the time to send material to donors and prospective donors, take the time to make an ask for a donation. In doing so, make it easy for the donor to give a gift to you. Do not make it an art project. Include a pre-printed response device and an envelope for ease in returning the donation. If you are not going to make an ask for a donation, do not bother to send the fundraising or stewardship piece. I cannot recall the last time I received a new donor welcome package. In fact, I was surprised when I received one from McGrath Foundation last week welcoming me as a new regular giver. The McGrath Foundation welcome pack included a nice letter from the McGrath Foundation Donor Manager, a thank you card with a photo of lots of smiling people dressed in pink, a brochure about the McGrath Foundation, a calendar, and a McGrath Foundation branded carry bag for me to use at the supermarket. This package makes a recipient feel special and, at the same time, educates the donor about the McGrath Foundation while giving the donor two functional items back – a calendar and a carry bag. The McGrath Foundation welcome pack, delivered in a window envelope, was likely generated in mass to all donors who signed up during a recent telemarketing campaign run by OURTEL. The caller who reached me from OURTEL, a woman named Wendy, sounded as though she could have been anyone’s mother. She was kind, spoke well, and educated me about the reason I needed to become a regular giver to McGrath Foundation. I gave because of the call and because Wendy caused me to realise the need for breast care nurses. The call was so terrific that I asked the caller for the name of her company and also her name. 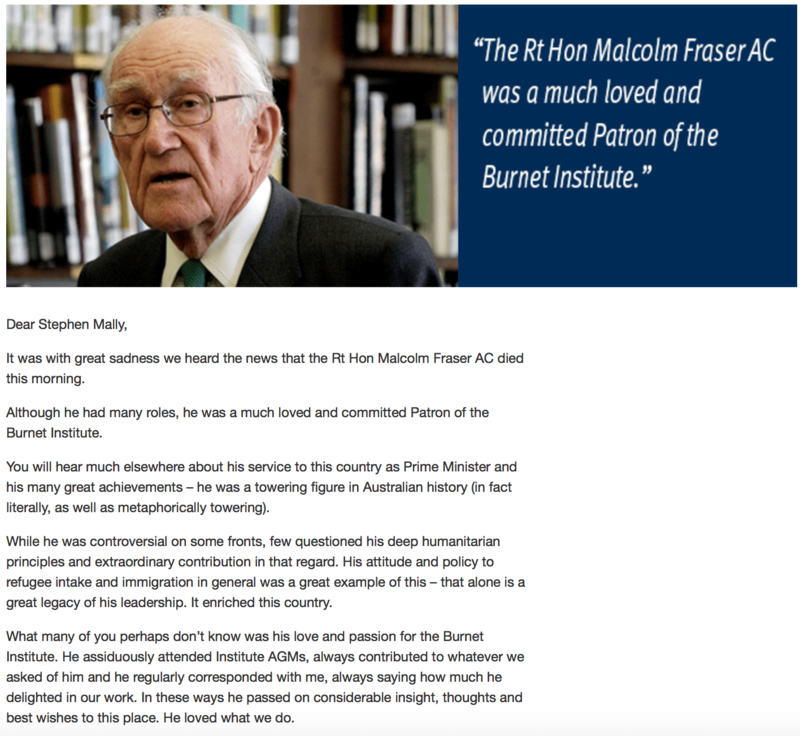 I later sent an email to the CEO of the McGrath Foundation telling her about it. Congratulations to McGrath Foundation for a terrific campaign. Other organisations should use this as a model. Creating and sending an appeal in a few minutes or less? Impressive. 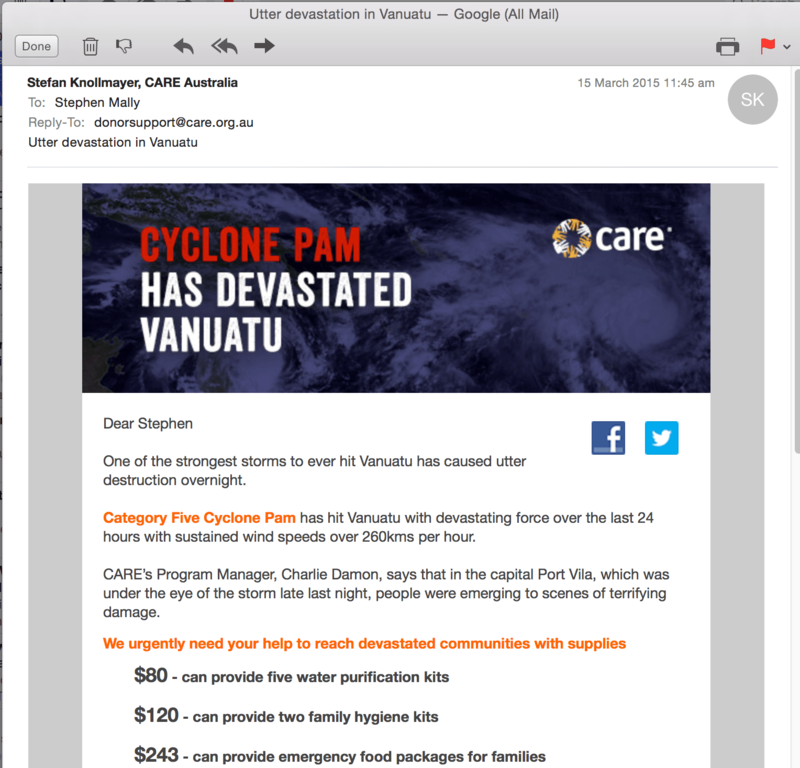 CARE Australia was able to send an appeal out about Cyclone Pam hitting Vanuatu within hours of the cyclone’s impact. This email reached my inbox seeking emergency donations to help people facing life threatening devastation. 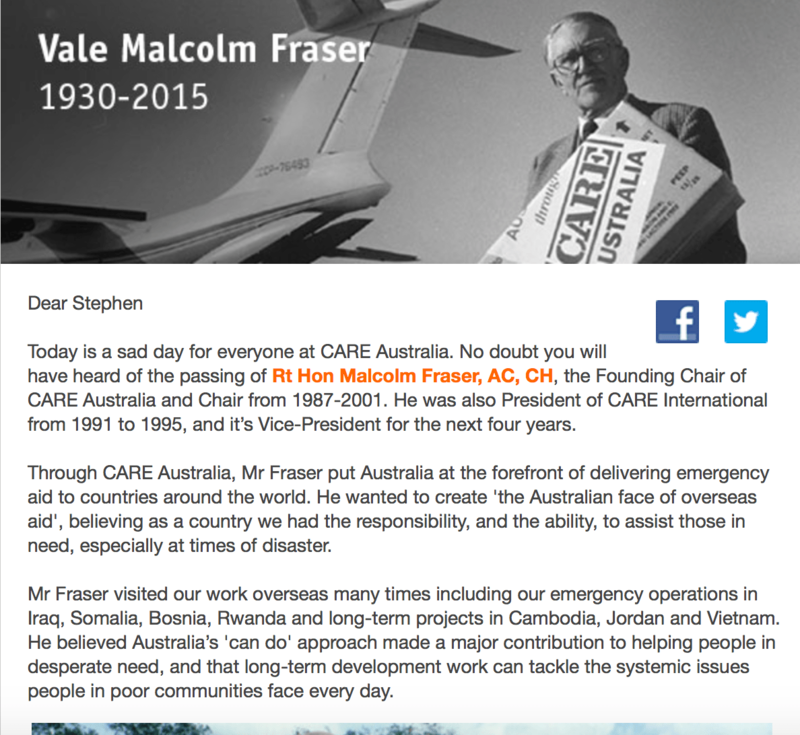 How did CARE Australia get this out so quickly? In the case of a cyclone, CARE Australia was aware, via the international news, of the cyclone’s path and potential destruction. There was a bit more advanced notice on this one than, say, a hurricane or some other catastrophe. Nonetheless, organisations like CARE Australia have appeals like this ready to go so they may be launched in a moments notice. The fact is all international relief organisations need to be ready to launch appeals quickly. Your organisation should be able to do the same. What if a medical research organisation needed to announce a big breakthrough? What if a hospital or health organisation wanted to announce an advance in a procedure? Any of our organisations might have something exciting or some sort of issue to get out quickly. Yet, not all organisation are ready to push these type of communication out in an hour. Organisations should plan for such an emergency/urgency and hope you never have to use it. It is better to plan and not have to use it than to not plan and be unready to get something out when the urgency presents itself! ‘Tis the season for non-profit organisations searching for the ‘perfect’ database. There are countless organisations in Asia-Pacific searching for a new constituent relationship management (CRM) or Supporter Relationship Management (SRM) solution. All of these non-profit organisations are attempting to find the right fit, which will accelerate their organisations productivity. 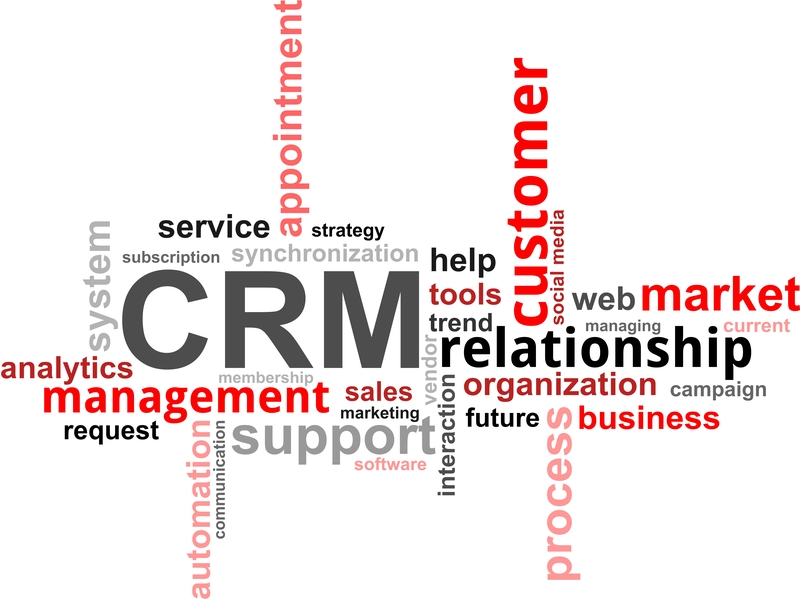 There are about 8 CRM/SRM key products or platforms in the Australian marketplace. Those products or platforms have many things in common, but there are some key differences across the systems as well. Additionally, a single supplier may have a variety of solutions to offer non-profit organisations. Do your research before you approach these companies. Non-profit organisations thrive on relationships staff create with donors, volunteers, and others. When a non-profit selects a new CRM/SRM, the suppliers are often very focused on the relationship. Ask current customers whether the relationship continued after the point of sale. Has the supplier continued to develop the relationship 1, 2, 3, 4, or 5+ years down the road or do they only contact customers when there is a sale to be had? Remember, a relationships with a the CRM/SRM supplier goes beyond customer support. The relationship is about customer service. Are you really confident of your non-profit organisation’s business requirements? Are you able to articulate those business requirements to the market? Being able to communicate the requirements of each department in your organisation is essential in order to allow suppliers the opportunity to determine the best fit within their own product set. While there are many products in the Australian market and they have many attributes in common, there are some key differences in the systems as well. It troubles me when I hear an organisation is signing a contract with a supplier simply because the supplier was “very nice” and “very professional” in the sales process. It further troubles me when an organisation is signing a contract with a supplier without having done their due diligence and conducted a search beyond that one supplier. Moving away from your organisation’s current CRM/SRM may very well be the right decision, but it is not always a wise decision for every organisation. First you need to identify reasons you are looking to move away from the CRM/SRM. What are the reasons you feel the current system does not meet your organisation’s needs? Often times those reasons are not about functionality, but about internal factors such as business processes, training, and change management. No matter what CRM/SRM you adopt, your organisation may face the same internal issues again unless these issues are addressed. Business requirements identified for your organisation. Future growth plans and strategies. Examine the current CRM/SRM to determine its strengths and weaknesses. Be sure to examine what impact your organisation has had on the determined weaknesses. Sometimes this is the most difficult task to own. Conduct a requirements gathering exercise and confirm the requirements with subject matter experts (SMEs) to be sure of accuracy. Write a request for proposals document asking suppliers to respond to specific areas of interest to your organisation. You will seek information about functionality of the product, information about the supplier, and responses to questions. All of these will study the supplier’s strengths, weaknesses, stability and other critical factors. Conduct a meeting with suppliers to review your process documents and to be available to answer any questions. Create an internal selection committee. Review proposals and answers to your requirements documentation. Conduct demonstrations by suppliers about proposed product lines. Include an expanded audience (beyond your selection committee) to gain buy-in from staff across the organisation. Check references offered by suppliers. Also, check references not provided by suppliers. You would not hire a candidate for a position simply based on what the references they provide say about their past. Simply calling the references a supplier puts forward is limiting. Negotiate price. Whatever price the supplier puts forward is not the price that will be agreed to in the end. The fact is the supplier will want to know more information about your organisation, your business requirements, and other factors before the supplier is able to quote a more exact price. Remember price is only one piece of the overall process. Be sure to think through costs you will incur internally, as well, such as staffing and other variables. Selecting a CRM/SRM may well be the biggest decision and the largest investment your organisation makes. Investing in the process and ensuring your organisation makes the right decision is critical. Once you select the CRM/SRM, the fun part starts – the implementation! I will write more about the implementation in a future post. Does all of the above seem a bit daunting? Hiring experts, like FundraisingForce, who have worked on the supplier side to help you to navigate the process. Prepare for your tax appeal segmentation – now! Believe it or not, we are talking Tax Appeals already. In fact, we are…a little late. It’s surprising the organisations that send the same package with the same copy to everyone on their data set simply because it’s “too hard” to segment the data set and to craft messages for each segment. Other organisations rely on suppliers to segment the data when, in fact, these organisations could segment their own data with just a bit of help. Organisations using The Raiser’s Edge, or other marquis CRM products, have the tools to create segmentation in house if they simply had the knowledge. Any organisation lucky enough to have a CRM as powerful as The Raiser’s Edge, or the others in the market, should gain knowledge from an expert to create segmentation in house. It is not enough to bring in an outside expert to simply create your segmentation for the upcoming Tax Appeal. The knowledge should be transferred to your staff so segmentation may be created for future appeals as well. Sending an appeal to everyone on the database simply because the supporter exists on the database is not good enough. Invest some time to create the segmentation on paper and then work with a FundraisingForce Consultant to build the segmentations strategy in your database. Ensure the strategy is future proof and may be used for the Christmas Appeal and beyond. 1 July will be here before we know it. Your appeal should be dropping in May. It’s nearly mid-March. Let’s work together to ensure a successful Tax Appeal for your organisation. Stop. Do not train your staff. They will leave your organisation anyway. We have all heard supervisors tell us why we cannot attend a training course or a conference. My staff does not have time for training. There is no money in the budget. We will send you on a training course in the future. Why bother to train my staff? They are going to leave anyway. Studies about workplace learning show that investment in employees improves the organisation’s bottom line. 57% higher sales per employee. 37% higher gross profit per employee. The study also offers organisations — some for the first time — reliable ways to measure tangible results from a training investment. In a second phase of the study, ASTD identified leading edge companies for “Best Practices” ideas. Invest up to 6% of payroll on overall workplace learning. train 86% of employees on average. utilise high-end technology (Internet, Webinar, computer-based training) to complement classroom sessions. A graduate-level research project completed by Robert Klein, sales education manager for Nabisco, and aided by professor Dan Tanomery of Fairleigh Dickinson University, centered around what some U.S. companies are doing to train sales professionals. there is a tendency for more new product rollouts. higher employee morale (and better retention). training enhances the bottom line. training improves an organisation’s competitive edge. training saves supervisory and administrative time and costs. 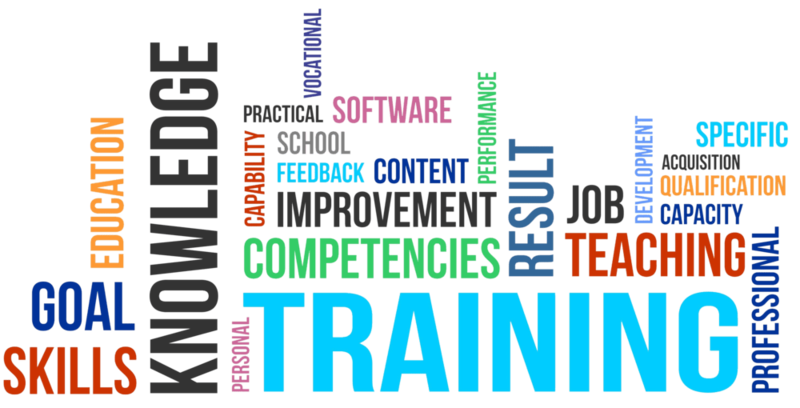 training improves employee satisfaction and retention. investment in professional development training is a win-win for a non-profit organisation and the employee alike. Each of us has a responsibility to our organisations and to our staff to ensure our teams are fully trained and have the capability to do the job we have hired them to do. FIA is offering courses in the classroom and also online to meet your training needs. Visit the FIA website for more details. Semester I of the 2015 FIA training calendar launches this month. 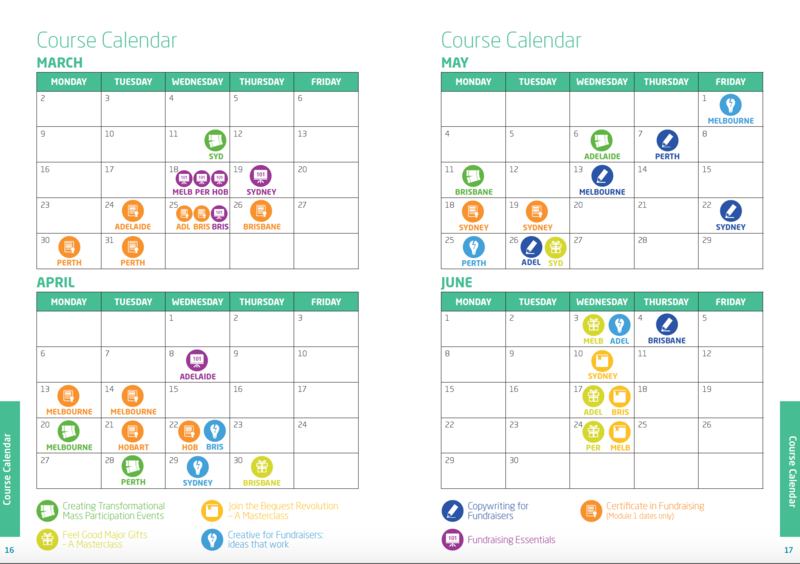 Signup for a course today and/or encourage your staff to attend a series of courses this year. FundraisingForce offers training on various fundraising database systems, including The Raiser’s Edge. We also offer training on Blackbaud NetCommunity. Contact us for more information and to tailor a programme to meet your organisation’s requirements.